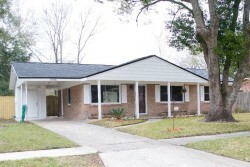 Completely renovated home with brand new fenced-in back yard. All new stainless steel kitchen appliances with granite counter tops! Both bathrooms remodeled with tile, unique decorative borders, and bathroom hardware. New tile, carpet, lighting fixtures, ceiling fans, doors, and shelving in closets. Finished laundry room with hookups. All fresh paint inside & out!